Milledgeville Main Street / Downtown Development Authority and the Milledgeville-Baldwin County Chamber of Commerce have established a new gift certificate program, Milly Money, to promote and encourage shopping local. 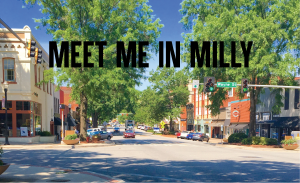 Milly Money can be purchased in denominations of $5 and can be redeemed at participating Main Street and Chamber of Commerce businesses in Milledgeville-Baldwin County. 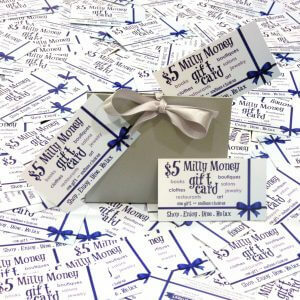 Milly Money can be purchased at the Chamber of Commerce (130 S. Jefferson St.) or the Milledgeville Main Street/DDA (105 E. Hancock St. next to City Hall) offices. One card with endless choices is always a great gift for others or for yourself. Remember, money spent local stays local and benefits small businesses, local workers, and most importantly…our great community as a whole. Download & print a list of participating businesses or pick one up when purchasing Milly Money.